I think it is safe to say that emotions have been running high over the last week. Division is in the air, so thick and tangible we can feel it in our bones. In the midst of political flurry and countless discussions I have engaged in with friends and family as to whether or not a certain man should have a place on the Supreme Court, I received a message from my friend Becca. She needed feedback on an introduction she was writing. I reviewed the text with her over the phone, pausing as one particular sentence caught in my throat: "Beauty can save the world." "I'm not sure about this," I said. Sure, beauty is important. Yes, it could warm our hearts. But would it really feed the hungry? Save the refugee? I wasn’t buying it. In response, Becca sent me this lecture given by an older Latina woman. A professor at Loyola Marymount who is quiet and unassuming, yet totally badass. Her name is Ceclia Gonzalez-Andrieu and the title of her talk is, "Can Beauty Save the World?" You guys. It was incredible. It tapped into the heart of why I want to write and it's helping me shape a response to the ever expanding net of division and vitriol going on both around me and inside me. If I could sum it all up in the most basic of ways, Gonzalez-Andrieu defines beauty as all the tiny moments of joy and truth that remind us we are human and that there is hope. And hope is what carries people, even as they hunger. It’s what keeps them hanging on until they are able to get that next meal. Trusting in beauty still remains a challenge and Gonzalez-Andrieu explores the many reasons why, traveling all the way back to the history of western civilization. She asks, "Why do we mistrust beauty? We were taught to mistrust it by those who want to exploit us. Because when we are in [beauty's] throes, we cannot be controlled and stripped of our humanity." Dang. I feel like that captures a whole lot of what's going on right now. Both sides -- left and right -- feel that the other side is trying to control them and strip them of their humanity. Aren't those the two facts we tend to forget most often? That we are human (not robots checking off our to-do lists, or endlessly running from one distraction to another). And that there is hope -- even when we can't see it. In life, in politics, and in justice, there are many things we ultimately can’t control. What we can control is our own personal fight for beauty. For finding it, owning it, creating it, and cherishing it. Even if it doesn't save the entire world, it just might save YOU. I know this was the longest introduction ever, but without further ado, here are the five ways I am embracing and creating beauty in my own life. These are some of the things that are saving me right now. I hope they inspire you, too :). 1. Creating More Than Consuming. This is a simple principle I learned from the above video by Sadia of Pick Up Limes. FYI, when she talk about the importance of creating, she doesn’t necessarily mean making arts and crafts projects. She says we can create all kinds of different things — from meals to relationships, to welcoming atmospheres within our homes. "When we consume more than we create,” Sadia states, “we tend to feel drained of energy. A little disheartened, maybe. We lack self-confidence because maybe we're comparing ourselves to other people, or we're just not doing all that much. But when we shift that ratio, making sure we create more than we consume, that's when we tend to feel more happy, motivated, productive, and maybe even more self-assured." I couldn’t agree more. Creating over consuming is a ratio I am actively striving to maintain in my life, and when I do, I feel an enormous sense of peace. 2. 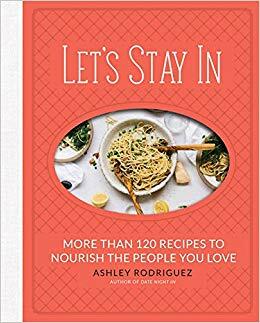 Ashley Rodriguez's Latest Cookbook: Let's Stay In. Want to create and then consume? Or, should I say, "Have your cake and eat it too . . .?" ;) Either way, Let's Stay In is overflowing with inspiration and is truly a celebration of life. More than just a cookbook, Ashley's focus is on bringing people together and slowing down enough to notice, smell, taste, and savor. From her storytelling, to the recipes and the stunning photography, the release of this book couldn't be more timely, as it's helping me eat well, have fun, and reconnect with what matters most. 3. Guided Meditation Videos With Jackie Viramontez. While I do love meditating, I am not so great at meditating on my own. That is why I look forward to every single Monday when my friend Jackie comes out with a new meditation video. Each week focuses on a different topic -- from loneliness, to embracing new beginnings. She has a soothing voice and bright smile that is sure to bring moments of beauty and truth into your life. 4. Journaling Everyday Through 750Words.com. As an author, I believe strongly in the value of a daily writing practice. It's a discipline and a way of training yourself to censor less and write more. Grammar doesn't matter. No one else is going to see it, and it can be just as simple as typing your daily prayers, or examining the many thoughts spinning around in your head -- which is something that can be valuable whether you are a writer, or not. What I love most about this website is that it's designed to give you a simple, no-nonsense platform to type daily and be notified once you reach your goal of 750 words. It saves all of your work, keeps it totally private, and enables you to download it to your computer if you ever want or need to. 5. Watching the Sunset With My Husband. Paul and I have opposite work schedules, which means we only have one night off together -- two, if we're lucky -- each week. We've been making the most of them by riding our bikes to the pier and watching the sun slowly set over the Pacific Ocean. It's free, it's easy, and it gives us to time to reconnect, both with each other and with the many moments of beauty that are happening all around us. Whether we pay attention to them, or not. How about you? What’s been saving you lately? Please let us know in the comments below!